"T&A business reporter Chris Holland meets the founder of Bradford's top new business..."
Very excited to see the article in below featured in the Telegraph & Argus newspaper. Chris visited us on Monday the 1st of August, and it was great to share all the exciting things that we have been doing since winning the new business of the year award back in June. I'm very proud of everything the team has achieved - please do share this post so others can hear about us - and the offer is always there for you to pop in for a coffee and see the boys in action. If you haven't already, please do "like" our Iron Octopus facebook page. We won't clutter your newsfeed - but we will share examples of work we are proud of - and that we feel demonstrate steel with soul. To entrepreneur Ben Green a great deal. His award-winning steel fabrication business carries the mantle of Iron Octopus, a name that came to him in a dream. "I didn't want to call the business something like Green Fabrication. I wanted the name to be a recognisable brand. Iron Octopus appeared like an epiphany in a dream and I knew it was exactly what I was looking for," said Ben. The distinctive and unusual name has played a part in the firm's first successful 12 months which culminated in it being crowned New Business of the Year at the 2016 T&A Bradford Means Business awards. It also attracts the attention of potential suppliers and customers . Ben said: "I get asked about the name every week and it has helped to bring in business with the result that we haven't had to go out hunting for work, So, it is effective as a brand." 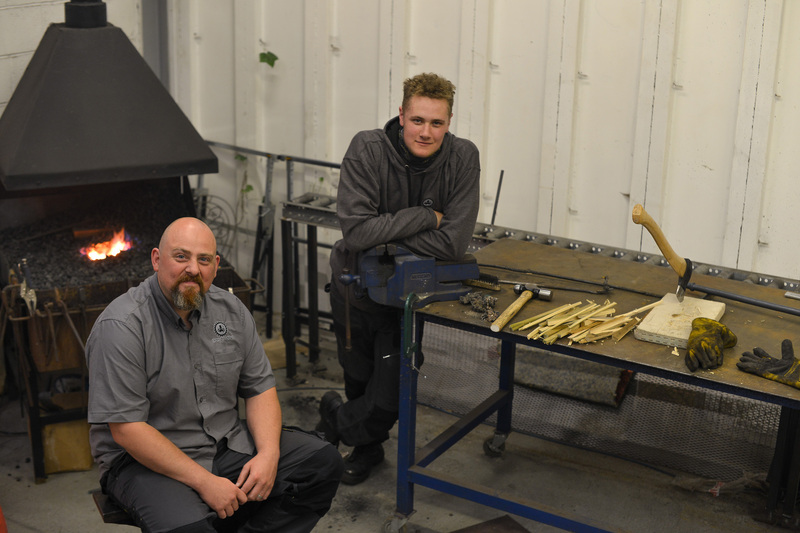 The awards win topped what Ben called a “stellar” first 12 months for the Baildon based business he launched with son Daniel, who is an apprentice fabricator. The first year of operations has seen Iron Octopus build up a health order book and exceed the growth rate in Ben's three year plan. The company has also been admitted to the Guild of Master Craftsmen. Ben had worked in metal fabrication for five years until he left his job last April to open his own workshop. He had previously spent time developing the business concept, doing market research, creating a marketing plan and analysing start-up costs to prepare a business plan and forecast for the first year's trading. A key consideration in his plans was use of the internet and e-commerce to generate sales. It was an area in which he had previous experience having after working in sales since the age of 16, including five years as a mortgage team leader at Bradford & Bingley. Ben and his wife Angela, who has more than 15 years experience of developing customer services, spent many late nights developing the buying process, supply chain management and building the website. "Approaching things in a planned and thorough way laid the foundation for a sound and successful business. Our ethos is simple- put the customer at the heart of the business; be different in the market; set the standard – and keep setting it. "Embracing social media and pursuing a robust online sales process has also been a key part of our progress to date. It has meant we are about six months ahead of original projections in the three year business plan," said Ben. expand into larger premises locally over the next few months in order to create more space and bring processes such as powder coating in house by joining forces with the current supplier. Ben said: "Moving to larger premises and bringing outsources processes into the business will bring our costs down and also give us more control over quality." While making gates and railings is the bread and butter for Iron Octopus, Ben is developing bespoke products involving more fancy ironwork. He has also recently invested in a modern blacksmith's forge and an 18th Century anvil to widen the firm's range. Daniel and employee Peter Thornton are each spending time with Ian Hogg, blacksmith at Bradford Industrial Museum, to hone their skills in this area. "This investment means that we are among only a handful of businesses across the UK offering both forge work and modern fabrication. I want to maintain artisan skills and it's great to see two young lads with a passion for what they do. We wouldn't be where we are today without them. Hopefully, by this time next year we'll have two more working here," said Ben. Ian Hogg worked with Iron Octopus on a project for the restoration of the Priest's House at Barden Tower, Bolton Abbey, for which the firm designed and made bespoke lights, floor standing candle stands and decorative staircase railings in an authentic medieval design to complement the surroundings . It is just one of several prestigious contracts carried out by Iron Octopus in its first year. The firm was recommended by a customer for who, it made some bespoke tables to design and make a Santa's sleigh as the centrepiece for the 2015 Christmas display at The Home in Salts Mill. Iron Octopus has also produced two Italian balconies to a tight schedule for the Saatchi gallery in London for use in a Versace fashion show. After the courier let them down at the last minute, Daniel Green rearranged his workload and delivered the balconies in a hired van. Both these projects earned glowing testimonials from satisfied customers. Publicity after winning the Bradford Means Business award has also led to Iron Octopus being commissioned by a West Yorkshire design company to produce Christmas displays in 30 stores for a leading footwear brand. "These projects are the kind of hand crafted bespoke work that I want to expand. Gates and railings are straight forward fabrication work and essential for our turnover but I am keen to grow bespoke work involving more intricate design and craft. "These jobs involve a high degree of creativity on production and use of materials as well as dialogue over the designs and production process. That's Factor X in our business - the ability to communicate and think how customers think to match their mindset and aspirations. My background in sales has helped with that.
" I like to think that we are achieving our aim of creating steel metalwork with soul," said Ben. Apart from a wide range of domestic customers, Iron Octopus has a growing lost of commercial clients having completed machine safety equipment for nearby Manor Paints; mounts for extraction ducting at Shipley based Teledyne Systems; a dental technician's work station and decorative marquee crowns for an events company. and large patio planters with adjustable feet. Running a steelwork business follows a lifetime's interest in the subject for Ben, 38, who spent hours watching his sales engineer father working in his garage. Ben said: "Apart from the B&B, my sales career was always based around technical products and I have always been around steel and steel working.After working for a friend in a fabrication business I decided to take the plunge and set up on my own.
" I still get my hands dirty but as the business grows and Daniel and Peter develop their skills, I will need to spend more time on growing sales, strategy and building up the business." Use of information technology has underpinned the Iron Octopus business model, including and ordering and stock control system, computerised accounts, an e-commerce website and a strong social media presence. Computer designed technical drawings are used on projects and products are delivered using an online courier booking and tracking service. "Embracing e-commerce has given a greater customer reach all over the UK and provided a straightforward purchasing process. It gives customers choice and convenience – at the click of a button. E-commerce allows for better cash flow processes and stock control and reduces the amount of back office work," said Ben. While he's in it for the long term, Ben's intention is to ultimately hand over the business to Daniel, who is 19, and possibly younger son, seven year-old Zachary in due course. "Winning the Bradford Means Business award was fantastic and a great boost for us. But I don't aim to be Mr Big. As long as I can provide a good solid income for my staff and earn a decent living myself through making quality products and providing great customer service that's fine. "If that means remaining a medium sized business , then OK," said Ben.